Unveiled during the first Cub Prix round of this year’s season was the 2019 Yamaha Y15ZR V2, better known amongst local supercub fans as the “Y Suku“. No pricing is as yet available but Malaysian distributors Hong Leong Yamaha Motor (HLYM) said an official price will be released next month, pending approval. On display were four colour options for the Y15ZR V2 – Striking Cyan, Blazing Red, Storm Blue dan Dynamic Grey. To sweeten the deal, purchasers of the 2019 Y15ZR will be give a disc brake lock with a value of RM100, free. As is known amongst followers of the supercub scene, the biggest change for the Y15ZR V2 is the headlight, which comes in a new shape and uses LED lighting. Inside the cockpit, the analogue meter is replaced with an LCD display. Going by specifications of the Y15ZR released in other ASEAN countries, Yamaha’s supercub has gone through some dimensional changes. This includes an increase in length and height by 15 mm and 20 mm, respectively, while the rider sits 15 mm higher from the ground, with the Y15ZR V2 weighing 2 kg more than the previous model. This increase in weight could be attributed to the use of a larger front tyre, now sized at 90/80-17, as well as a redesigned rear suspension. Other changes to the Y15ZR V2 include a wider front fender to accommodate the larger tyre size, a passing light and engine kill switch. Other components remain the same, including the liquid-cooled, 150 cc, single-cylinder SOHC engine, matched to a five-speed gearbox. Power is claimed to be 15.4 PS at 8,500 rpm and 13.8 Nm of torque at 7,000 rpm, with fuel capacity remaining the same at 4.2-litres. The post 2019 Yamaha Y15ZR shown in Malaysia – price in April appeared first on Paul Tan's Automotive News. 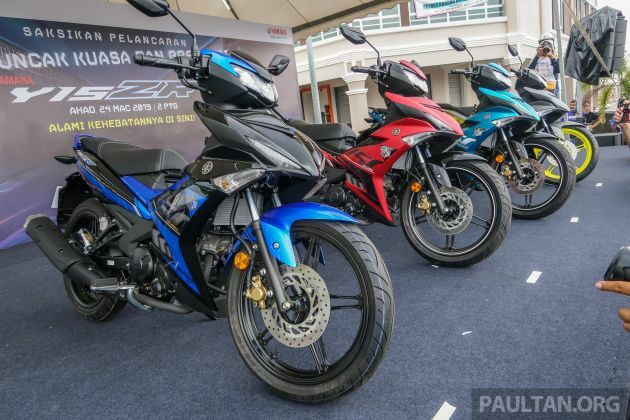 0 Response to "2019 Yamaha Y15ZR shown in Malaysia – price in April"